Thomas Bailey Aldrich was an American poet, novelist and editor. Of his many books of poetry and fiction, he may be best known for his semi-autobiographical novel, The Story of a Bad Boy and his collection of short stories, Majorie Daw and Other People. 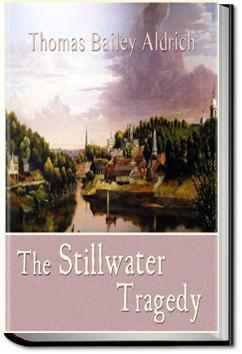 The Stillwater Tragedy is set in a small New England manufacturing town whose tranquility is disturbed first by the murder of one of its prominent citizens followed soon thereafter by a general strike of all the trades-unions. As the story develops, Richard Shackford, the murdered man’s nephew, finds himself inextricably caught up in both these events. This is a very interesting little book. It was written in 1880 in the style of the time, so the reading may seem a little stilted.